Non-equalizing thrust bearings can tolerate a limited amount of misalignment and continue to operate. Learn how to determine the maximum amount of misalignment before the bearing's performance is adversely affected. How much static misalignment capability does a non-equalizing thrust bearing with spherical supports have? An example of misalignment is shown in Figure 1. This alignment condition is based on the assumptions that the collar (or thrust disc) is perpendicular to the shaft, the collar surface is flat and smooth, and the runout is within an acceptable tolerance. The geometry of the support is a significant factor in determining how much a non-equalizing thrust bearing can be out of alignment. The line contact support shown in Figure 2 cannot tilt in the direction of the misalignment and has minimal deflection under load. A spherical support, as shown in Figure 3, tilts in both the tangential and radial directions and deflects under load. This deflection greatly improves the misalignment capability of the bearing. A KingCole size 8225, direct lubricated, non-equalized thrust bearing similar to the bearing shown in Figure 4 was reviewed. Note that the "8" refers to the number of pads and the "225" is the radial length of the pad in inches when divided by 100. As shown in Figure 5, the results produced a maximum misalignment of 0.08°and a minimum of 0.01°. At 1.0 MPa unit loading, the pad has a considerable amount of additional load capacity so it can be misaligned a significant amount. At the higher loads, the pad temperature approaches the maximum limit as the surface speed increases and therefore results in a lower misalignment capability for the bearing. 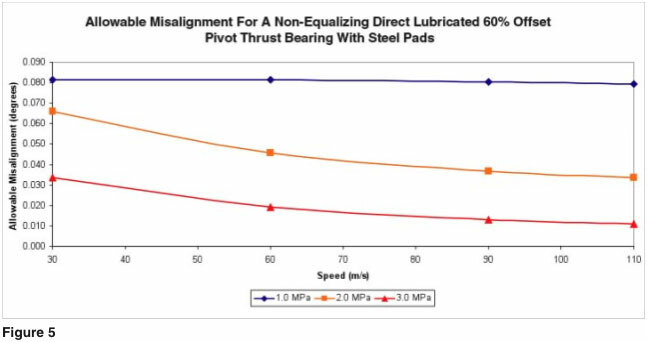 The conclusion is that the maximum misalignment value depends on the thrust load applied to the bearing and the surface speed. Each application needs to be reviewed independently based on the actual operating conditions and maximum temperature limit requirements of the bearing.